P.S. For a limited time you can buy an autographed copy of my book here online, no please form an orderly queue or small children and more importantly Cats may get trampled in the crush. Or you can get a paper back edition of Getting Out on Amazon.com ! Hello, come in, look around or sit down in a comfy chair and let me get you something, you look tired! You aren't over doing it are you? You are! Well I know what you need, you need some rest, so put your feet up and relax, read a book maybe? Actually I have the very thing to read too, aren't you lucky? Have you heard of my wonderful books, no? Well apart from firing my advertising department, I have nothing to do now, so let me tell you just a little about them. "The Cat's Travelogue" is unique. 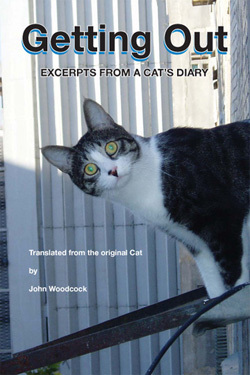 Actually it's the first travelogue written by a Cat or indeed any member of the feline genus and will have you rolling in the aisles. This monster of a book is just the best thing you will read this year or indeed this decade, unless of course you read my other book "Getting Out Excerpts from a Cat's Diary." The extremely careful research I conducted for this book took over five years and I promise if I find it I will include it in a new updated edition, as I will also include any country, which is currently exempt from inclusion in "The Cat's Travelogue" because they are 'sponsoring' it. You may have heard about my sponsorship 'arrangements' they extend to other countries and tend to work like this: I sent a copy of the relevant chapters to countries which I thought might be interested in 'sponsoring' me, stating that in exchange for a large 'consideration' I will exclude their country from my unputdownable thriller of a book. Unfortunately this practice has been described by some of the more outraged countries as "blackmail," but to my way of thinking blackmail is a dirty word and I prefer 'sponsorship.' Actually my sponsorship deals have had a significant and unforeseen impact on my book, which was growing and shrinking more than an Accordion playing the Star Wars theme. It also means that if the countries in question stop providing their generous sponsorship of my wonderful book, it may well be one of those very rare books to actually get bigger with each imprint, as my sponsors have been warned! In this unputdownable book I travel the world stopping to look at it as though it smells and unfortunately most of the places I visited by mistake do smell rather badly. And I have to say I was not impressed with most of the places I visited from Afghanistan to America most were just plain awful and then there was Bangladesh... Still I promise that my unusual and controversial journey will leave you laughing so much you may err... wee yourselves! I am so confident that everyone who enjoyed my first book will kill for my second, and anyone who reads the second book first, will not hesitate to buy the first book - but of course don't stop there buy as many copies as you like in any order you like and make this extraordinary Cat very happy. 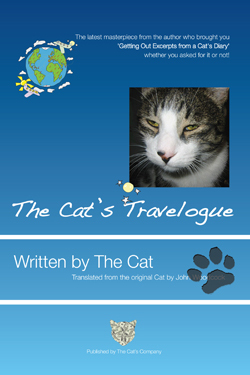 If you want to sample "The Cat's Travelogue" you can download the first 20 pages here. You can get a paperback edition of "Getting Out" on Amazon.com or right here! If you want to sample my wonderful book you can download the first 20 pages here. IT IS WONDERFUL AND UN-PUT-DOWN-ABLE, there that should be enough of a recommendation after all it comes from me and I really have great taste! Over 400, yes four hundred pages of laughter! The Cat is very inventive and although he finds it difficult to escape, he does manage to make his life as easy as possible, borrowing someone else's credit card and surfing the internet is one of his favourite past times, another is trying to guess who is going to do his voice over in the blockbuster animated movie that he knows will be made from his diary after publication? When he does briefly escape, he is mistaken for the 'Beast' a large black Panther that local legend says escaped from a Zoo some decades ago and takes sheep, though where it takes them, no one seems to know, not even the enormous media circus that turns up unannounced. Hello my unfurry friends, guess what? That idiot of a translator has written his own book, yes and on his own too, without any help from me - if you ever did! The book is the first in a series of books for children of all ages and it is all about the Trams of Prague (in the Czech Republic for those of you who are geographically challenged). It is actually rather good and if I tell you any more then you won't buy it and that might really not be a good idea, all I will say now is that when my friend Pam read it she couldn't put it down and I am sure that wasn't because she got cramp from holding the book in front of her face for too long. 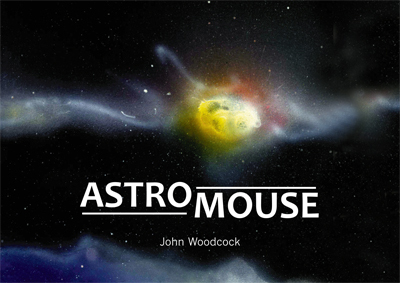 Astromouse the picture book for younger people. Astromouse is an 'exquisitely' illustrated picture book for young people aged 5 - 9. It is the wonderful story of Morris the Mouse who leaves his home planet Astro looking for adventure. One day he is speeding passed a small green and blue planet called Earth, or so his computer calls it and he spots an enormous Ice Comet which is on a collision course with Earth. What Morris does next will decide whether he is a hero and as importantly whether planet earth survives the collision with the Ice Comet!